If you’re suffering from multiple dental imperfections, you probably wish you could have a smile do-over -- and with porcelain veneers, you can! These thin shells completely cover the surface of damaged teeth, creating the beautiful smile you’ve always dreamed of. Keep reading to find out more about this transformative treatment offered by Dr. McKnight. 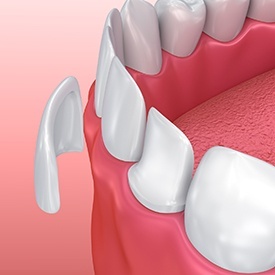 Patients who are in decent oral and overall health, free of tooth decay and gum infections, are usually good candidates for porcelain veneers. Your porcelain veneer treatment will be completed over the course of two visits to our Mesquite office. With the first, Dr. McKnight will evaluate your smile and facial structures to determine the veneer color, size, and shape that would benefit you most. You’ll have the opportunity to thoroughly discuss your goals and desires to ensure that you get just the look you want (it can help to bring in photos of what you do and don’t want during the initial appointment). Once Dr. McKnight has put together your treatment plan, he’ll prepare your teeth to receive the veneers. This involves slightly buffing off a bit of tooth enamel to make room for the new coverings. Temporary veneers are then placed, and your information is sent off to our trusted lab where your veneers will be expertly crafted. 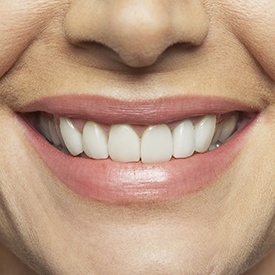 After about two weeks, your veneers will come back from the lab and be ready for placement. You’ll return to our office where Dr. McKnight will check them one last time -- and you’ll give the final approval before they’re securely bonded on. After that, you’ll leave our office the proud owner of a new, beautiful smile! Are you interested in showing off your best smile thanks to this transformative solution? If so, don’t wait to contact us today to get started with cosmetic dentistry today!